Please note that the content of this book primarily consists of articles available from Wikipedia or other free sources online. Radio Salankoloto is a radio station in Burkina Faso. It is broadcast on 97.3 FM from the city of Ouagadougou. It was established on November 22, 1996. It plays mostly African music from traditional to modern hip-hop. The radio is known for its important health and community awareness programmes. 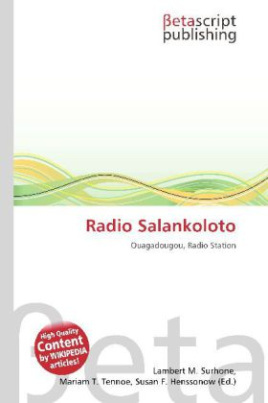 Radio Salankoloto acts as a "community telephone" by broadcasting community birth and death announcements and hosting phone-in talk shows. The radio station broadcast a 13 episode drama series named "Viim Kuunga" at least twice in the afternoon and evening at times. In Mooré, "Viim" means life, and "Kuunga" is a traditional drum that alerts people during emergencies. The title literally means: "Alert! Save your life!" and was broadcast to increase knowledge of HIV/AIDS.